Any development project that includes as a measure of its value the benefit it provides to a community is never easy to bring about. Such projects are generally large in scale. The community they benefit is made up of competing interests and objectives. And the number of entities that have a stake in the outcome, and thus a voice in the planning of that outcome, is large. We ascribe to the notion that there is a common wealth in which we all share. We hold to the idea that we each possess fundamental rights. And we elect as leaders of our representative government those we expect will act to preserve and protect our rights as they strive to advance our individual interests. Therefore, any proposal that relies on public funds or resources faces a difficult task to gain approval of the use of these resources in order to proceed. The debate on the Cape about the proposed offshore wind farm is one current example. So, too, is the proposal to establish a regional wastewater facility intended to protect the Cape's water supply. A half century ago, Cape Cod residents were engaged in debate about the merits of using public funds to take private lands in order to establish the Cape Cod National Seashore. The idea seemed directly opposite to the Cape's heritage of independence and self-reliance. It undercut our Constitution's reverence for individual property rights. It threatened entrenched economic interests. By contrast to these detriments, the benefits of the idea were abstract. There were few projects of comparable scope to look to for guidance and likely outcomes. Nevertheless, the idea stuck, and the years have long since established the conclusion that broad community benefits resulted. Without the seashore, the majority of us who do not make our living from the sea would have little appreciation of its grandeur or any sense either of the small habitats that make up our shoreline and at times get in the way of our recreational uses today. Now, the Cape Cod National Seashore is generally appreciated despite periodic controversies that continue to question how it fulfills its mission and interacts with its neighboring communities. And though it is well established, it continues to engage the public in questions of broad significance. One is the leadership role it is taking to define and implement projects that give meaning to the evolving concept of sustainability. Often associated with other emerging and broadly used terms like “climate change” and “green” initiatives, “sustainability” is semantically linked with these others because it, too, places value in living in a way that does not negatively affect the well-being of other generations of life on earth. Yet, the more intriguing application of “sustainability” arises from a definition that focuses more directly on its effort to maintain and improve our quality of life. Rather than a limitation on our activities that tends to arise when we focus on setting limitations to our use of resources, considering sustainability more as a way to find alternatives that realize equivalent or greater quality-of-life benefits opens up our thinking and encourages our creativity. Where these abstract questions and considerations begin to take meaningful, observable, and tangible shape is in projects (of which there are few) like the one the National Seashore is undertaking with other interested entities at the site of the old air station that operated for years in Truro. This project, called Highlands Center, takes to a next level what some other development projects have accomplished in their contexts. In Woods Hole, the addition to the Ordway Campus is a construction project that first incorporated sustainable concepts throughout. It showcases what is possible and what will become common as materials and construction practices learn from the efforts undertaken there. It's a beautiful, breakthrough piece of architecture envisioned by the much-honored architect William McDonough. In the mid-Cape, in Barnstable, the recent completion of the Lyndon Larusso Applied Technology Building at Cape Cod Community College is also worth noting and worth seeing. It applies new sustainable features in a campus setting that has now established a new standard by which other state-financed buildings will be measured against. In Yarmouth Port off Exit 7 on Willow Street is the new headquarters of the International Fund for Animal Welfare. It, too, incorporates many sustainable features in its design and construction. And even more, it is an incredible example of the reclamation of a formerly contaminated site, a former "brownfield" of which there are many more throughout the Cape and the rest of the state. As each of these projects has pushed the limits of possibility, the National Seashore, in its effort to reuse the old air station in Truro, has taken on an even broader set of goals in a setting that is even more constricted and complicated with regards to its site location. Highlands Center is a project that not only maintains but will actually improve our quality of life. As envisioned, it will be a center of scientific research regarding the ocean and the shoreline it overlooks. The science is already underway at the National Park Service's Atlantic Research Center, which functions as a field research site. 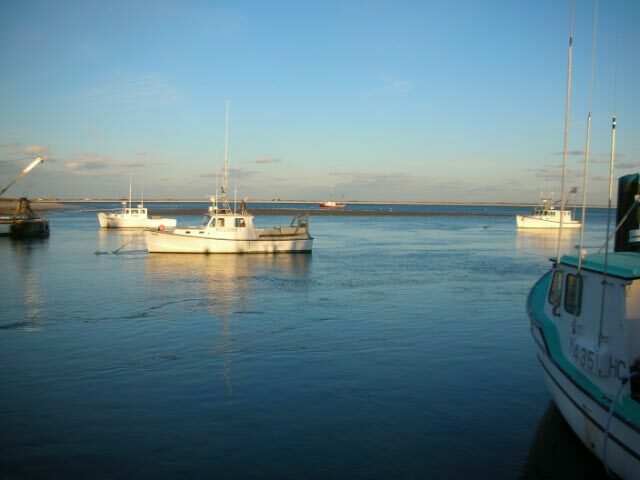 Similarly, the Coastal Wave Observatory Station has been operating at Highlands Center since 2005; this project was undertaken in conjunction with the Provincetown Center for Coastal Studies. Highlands Center also strives to sustain the arts. The Payomet Center for the Performing Arts at Truro installed a performance tent in 2006 in which it has presented theater productions on site. Under Guy Strauss' creative leadership as the Program Director, the Payomet Performing Arts Center has crystallized for other artists as well as the general public the possibilities that the site holds. So, too, the Truro Center for the Arts at Castle Hill has been the force behind the effort to construct and operate a wood-burning kiln at Highlands Center. The value of this initiative is far greater than the cost as it demonstrates the extent to which we can expand the capacity of arts-related creativity by establishing resources readily available to an artist-rich community. The Fine Arts Work Center, located in Provincetown, is working to establish a residency capacity at Highlands Center that would encourage creative exchanges among artists and offer an opportunity to the community to see firsthand the process and the struggles that artists work through in creating works that enhance our quality of life. These examples are just the jumping-off point for what Highlands Center can sustain. They suggest the kinds of real promise that exist at the site as the interests of the people that live in the region intersect with the talents and the promise that this site holds. These examples only begin to outline the possibilities that exist when one considers other demographic trends. As we live longer and age with greater well-being, more opportunity for multiple career pursuits, and an ability to exchange ideas instantaneously over greater distances because of technological innovations, the Highlands Center is a resource that is growing in its value. The market is expanding of people interested to engage in ways that challenge and stimulate their minds. The site is a perfect one for continuing education offerings that take advantage of the neighboring communities. In this context, Highlands Center can be a significant economic engine to connect visitors with the arts and theater of the lower Cape, the beach and the destination resorts of the region, and the thought-provoking residents who live and work and recreate on the Cape, often in purposeful quiet and solitude. Highlands Center is a place that could connect people who are already here. There is enormous educational promise to be found at this site. As educational institutions look to find ways to expand the resources of their faculty and researchers in ways that more broadly connect to a campus that extends beyond their existing facilities, Highlands Center is a place that could well serve as a point of connection. It's these connections that are the future of our global as well as our local economies. At an event that the Highlands Center hosted recently in Boston, Northeastern University professor Barry Bluestone presented some ideas on how a project like Highlands Center can work to stem the outflow of young people who are leaving Massachusetts for locations that offer a more desirable quality of life, one that is not only less costly but also one that presents greater potential for career development and opportunity. If you are interested to learn more about the effort underway at Highlands Center, please contact us. This is an exciting phase of the project's development. It relates well to the directions and collaborations that other institutions are shaping in their own contexts. Perhaps you, like us, are interested to look for ways to make these connections. Doing so would significantly expand our community capital and enhance the Cape's quality of life.